Don't worry! The annoying watermarks are never on the actual artwork. That is just to protect my art from illegal internet pirates who roam the internet seas. Arrrrrrgh! I love flowers and bought some blue orchids from the department store. 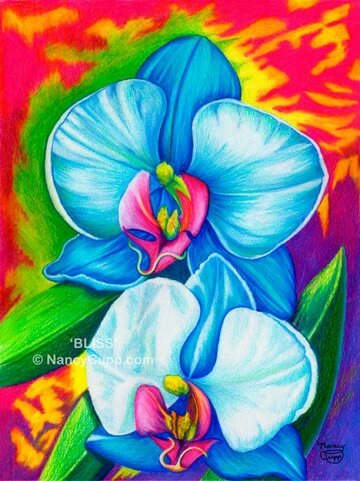 I’d never seen blue orchids before. I was able to keep the orchid growing for a few years, but, the following year, it reverted to its true color, which was white. I took several photos of it and did some colored pencil studies from them. Brilliant colors fascinate me. I’ve learned that when we get to heaven, we’ll see more colors than we are capable of seeing now. Since Jesus is the Light of the world, I think His light will reveal the most awesome colors that we can’t even imagine. That’s probably why I am attracted to vivid colors, because each color reveals a little bit more of His glory. I couldn’t think of a name for this painting, so I held a little “Name this Painting” contest and the winner named it Bliss. I liked the name but wanted a deeper understanding of it’s meaning. I found out that bliss means perfect or extreme happiness to the point of ecstasy, especially the ecstasy of salvation, spiritual joy, or the state of ecstasy found in heaven. Some synonyms are: above, heaven, kingdom come, New Jerusalem, paradise, sky, and Zion. There can be no true happiness until we are at peace with God and our fellow man. The Hebrew word for peace (shalom) has a much deeper meaning which includes completeness, perfect health, and abundance to every area of life: physically, mentally, and spiritually. The world cries out for world peace, but it will only happen with the coming of the Prince of Peace or (Sar Shalom).